I spent an easy two hours at the museum. It's not hard to get lost in these paintings. Several of them I went back to a couple of times. These are a couple of my favorites. Head of a Prostitute is from 1885. I found this portrait striking for its vitality and humanity. Van Gogh showed the woman with a great deal of dignity. And I just like the way that Van Gogh uses those wide brush stroke and distinctive colors. The skeleton struck me as just being funny. It seemed very contemporary and yet all Van Gogh. It also reminded me of one of the self-portraits from the first floor. I wondered whether this was a more grotesque self-portrait. The commentary about the painting speculated that Van Gogh was tweaking the teachers in the class where he painted the picture.Or perhaps he was channeling the future when similar images were used in anti-smoking campaigns. Whatever his motivation, it's yet another striking image in a museum full of them. I purchased the audio tour with my entrance ticket. I thought it added a lot to my visit. But I must also say that it also is a bit distracting. I was glad to have the voice telling me a little more about the painting I was viewing and the events in Van Gogh's life. But there were times I had to shut it down and just look at the painting. Nothing can compare with just gazing at these incredible works of art and becoming immersed in the scene. My next stop was Rembrandt's house. This is the place where he lived and worked. The house has been restored to appear as it may have during Rembrandt's lifetime. The curators seem to have been helped by Rembrandt's bankruptcy in 1656 because all of his possessions had to be accounted for and sold. Eventually even this house was sold. I was a little disappointed that more of Rembrandt's etchings were not displayed. The display space was filled with etchings from Hercules Segers, an artist who most likely inspired Rembrandt's work. Still it was a good visit. Here again, the audio tour was complimentary and it was a good complement to the visit. The ground floor theater was showing a documentary by Simon Shama that I watched for quite a while but didn't stay for all of it. I'll have to see if I can find it elsewhere to finish it. 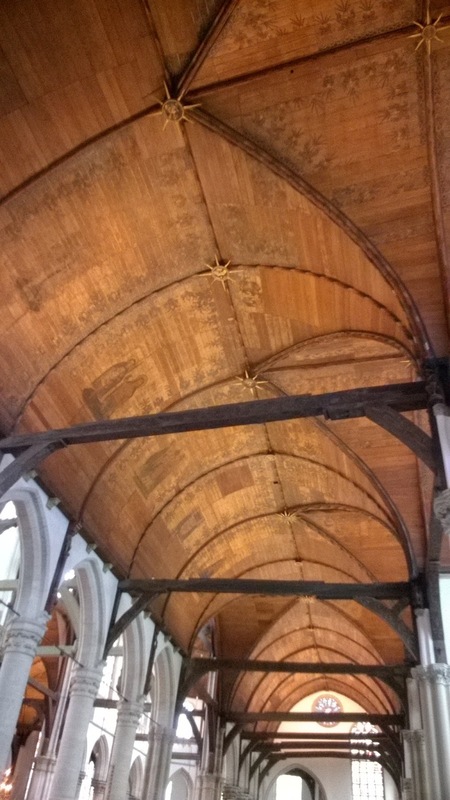 I finished the day with a tour of the Oude Kerk, the oldest building in Amsterdam. Unlike the Nieuwe Kerk, the Oude Kerk is still used for services. Here the gratis audio tour helped bring the building to life. 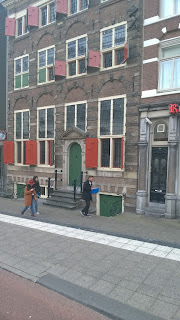 The tour was done with a professional actress who at various times brought in experts about the building or Amsterdam history. She provided a leisurely and informative stroll through the church. One of the many fun facts I learned is that more than 12,000 people have been buried under the floor of the church. From the moment you step into the church you're walking on graves. Of course, there isn't room in one building to hold 12,000 graves so they would periodically empty the graves so that they could inter others. One of the most famous graves belongs to Rembrandt's wife, Saskia, and it is marked with a sign. They stopped burying people here in the late 1970s. It's hard to describe the grandeur of this magnificent building. Glancing up at the ceiling, it looks like you're standing under a great many upside down ships. And they just go up and up. 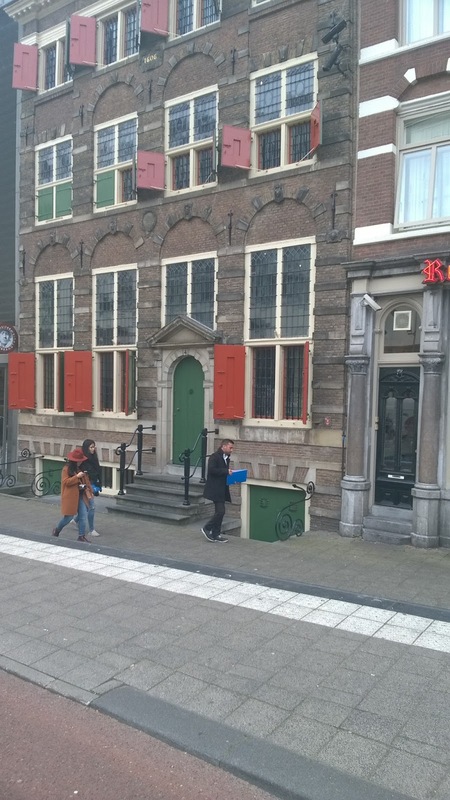 It's not possible to get a decent photo of the outside of the Oude Kerk because it is surrounded by businesses on three side and a canal on the other. Among the businesses just outside the churches doors are several prostitutes. The church is smack dab in the middle of the red light district. When Amsterdam was still relatively young, ships would dock close by and sailors would come pouring off the ships in search of what sailors would be searching for after a long voyage away from wives and lovers. Since there was a market, sellers appeared. Conveniently, the sailors could walk a few paces and confess their sins in the Oude Kerk. I almost didn't go into the Oude Kerk. I walked around it once just to get a sense of its size then decided I had better go in since it was the oldest building in the city. And I'm glad I did. The audio tour was first rate and the church is magnificent.